Why you should have a fire extinguisher in your car! Even if you don’t get down to the track, a fire extinguisher is a great investment to have in any car. Why? 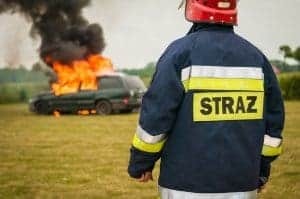 Well, here’s some interesting stats about vehicles and vehicle fires. Apparently there are 1 BILLION cars in the world. It is estimated that the number of cars worldwide is supposed to reach 2.5 BILLION by 2050. That’s a lot of cars on the road. Every motor vehicle contains many types of flammable materials. Fuel line ruptures, short circuiting electronics, hot exhaust systems, air bag detonators… and the list goes on… could all potentially start a fire in your car, or the car next to you, or the car INFRONT of you. BUT HAVE NO FEAR, THE KI BRACKET IS HERE, to bolt a very handy fire extinguishers within arms reach, so you can cool that car down should you need to. Really, what is the cost for peace of mind? One Response to "Why you should have a fire extinguisher in your car!" Faced with a problem of extinguisher fitting for this Sunday’s Inter-club Hillclimb Challenge at Rob Roy I found excellent reviews for Kapp Industries extinguisher bracket on the OzRenaultSport forum. A day later the bracket was fitted in the front passenger well of my Megane RS265 Cup which has manual seat adjustment. I can honestly say it fits perfectly without inhibiting seat use in any way. The genius of this design is its simplicity. Anyone not familiar with the car would assume the extinguisher was OEM!! Thanks Russell you are a micro-entrepreneur of the 21st century. You spotted a problem and solved it with the most elegantly engineered solution. I see from your website there are solutions for scores of car types. If you happen to be at Rob Roy this weekend and want to see this masterpiece of design, come find me among the Renault Club team. I’m in the metallic grey Megane RS with a Kapp Industries decal proudly displayed on the right rear window. OzRenaultSport forum members can still use the group discount voucher code if you are quick! Oh BTW if you don’t already have an extinguisher, take my tip and buy one from Kapp as it’s CAMS compliant. I will be once my current extinguisher is out of date! !